Structural datasets are still being worked on for inclusion in the model, and will form a component of future model versions. The following is a brief summary of how structural data are being analysed for future inclusion in the model. This comprises a shapefile containing fault polylines. 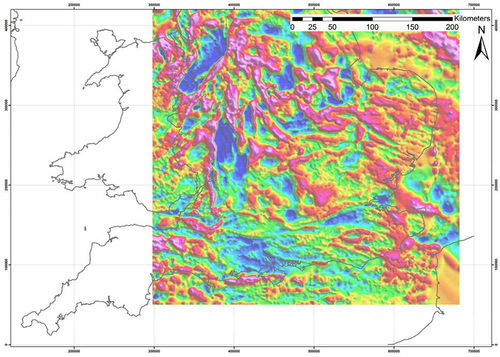 The dataset was established from DiGMap50 data and the digitisation of published fault interpretation. Each fault has been attributed with the original source and the line to reflect the throw on the faults as published (where available). Only major bounding features were included as the scale of modelling prohibited the inclusion of minor faults. The faults included are typically over 10km in length. No information is currently held on the fault dip or amount of throw on a fault. The dataset does not distinguish between basement faults or faults that cut the chalk. This was carried out by frequency matching and at set intervals. The data highlights linear features from which a gravity lineament map was produced. Figure 4 Reprocessed geophysical data showing the 2km upward continuation first vertical derivative map of the gravity. Base on the fault catalogue and the geophysical data a proposed structural model was produced as a GIS shapefile. This was primarily based on the model in Chadwick et al. (1996) and represents one interpretation of possibly many. However with the available data it is considered to best fit the observations and the structural history of the region. It should be kept in mind that this interpretation has identified possible large deep structures within the region and not all these structures will cut or influence the chalk. However faults will preferentially reactivate rather than initiate new faults and therefore these large structures are likely to have an influence on the deposition of the Chalk. Figure 5 Revised fault network in red with the BGS DiGMap625 data. 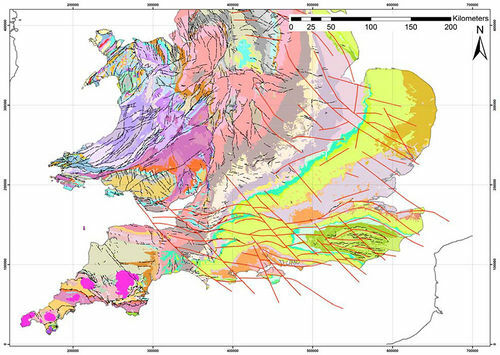 Based on the Tectonic Map of Britain, Ireland and Adjacent Areas (BGS, 1996) an initial 3D fault network was modelled to establish a work flow and test the fault interpretation. A series of cross sections were constructed and the fault shape with depth was digitised based on the structural understanding of the faults in the region. These are typically listric in nature and detach on a common horizon at depth. The total depth of the fault model was taken at an arbitrary depth of approximately 3 km. The faults were then modelled using the structural workflow within SKUA and the fault network exported as triangulated surfaces. The 3D fault model however did not take into account any published sections or seismic profiles and only approximates to the true fault network with depth. The revised fault model should be based on the interpretation established above and should be modified to take into account realistic dips and published data regarding the faults shape at depth. ↑ CHADWICK, R A, PHARAOH, T C, WILLIAMSON, J P, and MUSSON, R M W. 1996. 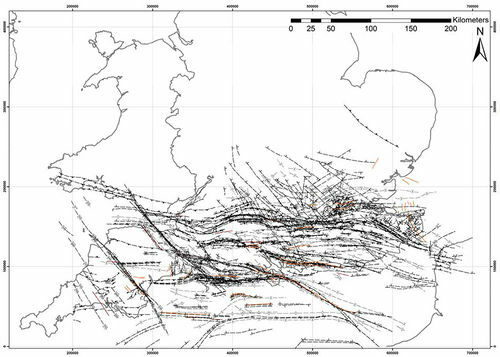 Seismotectonics of the UK. Final report. British Geological Survey Technical Report, WA/96/3C: Issue 1.0. This page was last modified on 27 July 2015, at 14:52.